To engage the others who also cherish Long Lake here in Hubbard County, Lou and Kay Schultz have started the guessing game again this year as to when we will have "ice-in" this season! 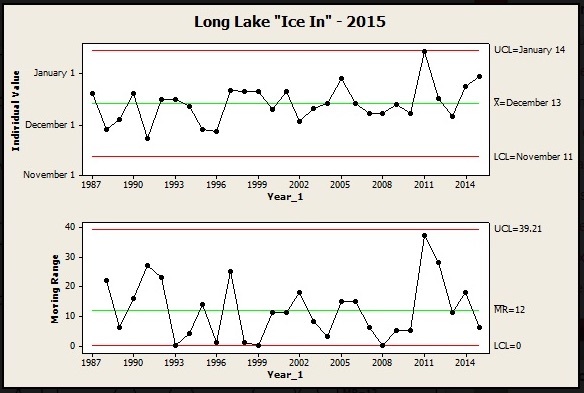 Using the 29 years of ice-in data on our website, Lou notes that the mean ice-in date is December 11th based on the online data. To participate for fun, please send your guess to longlakeliving@gmail.com. All those selecting the winning date will be recognized. A final drawing from ALL participants names by an unbiased observer will select one participant to receive the $20 gift certificate donated by an anonymous LLAA member. We have 4 guesses in so far...Keep the guesses coming in.